Here is my St Patricks Day mani. I liked the clover mani I created a few weeks ago for the money smart nail art that I had to create another one. Luckily I had already pressed a number of clovers ready for another mani. 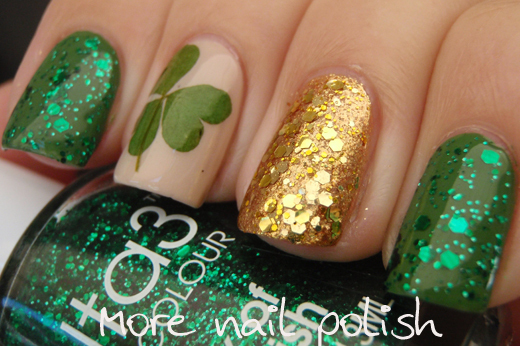 I've also loved seeing a number of other manis where ladies used pressed clover leaf, they have all been fantastic! Index and pinky: franken made with TKB Chromium green pigment topped with Ulta3 Luck of the Irish. Ring: OPI Golden Eye, Essence Make it Golden and Ulta3 Pot of Gold. Middle: Picture Polish Beige with press natural clover leaf. I just had to share this picture I took today. Mr 4 and I went to the National Botanic Gardens, mainly just to wander through Rainforest Gully. 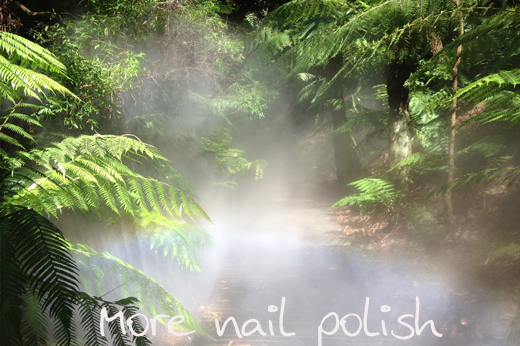 They create artifical mist and it's so gorgeous walking along the wooden path along the forest floor. I managed to capture this very light rainbow too. 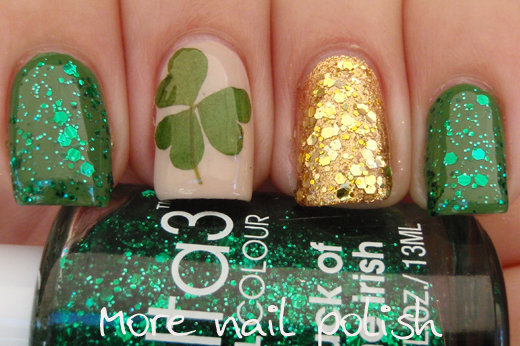 Love your Irish mani its got it all, green, gold and luck. I love how you snuck a rainbow in there too. 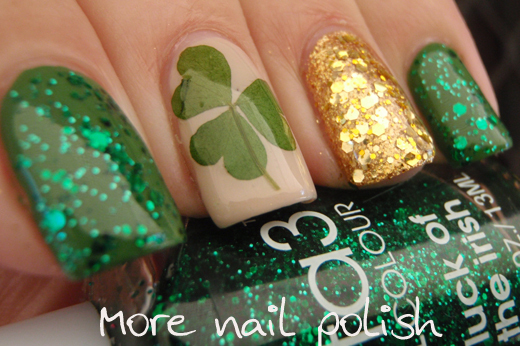 Sorry for not linking back to your blog I forgot where I'd come across the clover leaf mani. Perfect mani for St Patrick's Day and a lovely rainbow to enjoy. I love these!!! I really need to get some pressed flowers this summer. Love, love, love, true love! They look amazing! I love the pressed clover mani! I am going to have to look for some clovers of my own now. Too bad I didn't know about this previously or I could have rocked this mani today. love! you definitely started something with your clover idea! it was great inspiration!! Stunning! Wonderful blend of ideas! There is nothing not to love in this manicure! Great job!